The CDs included in this package contain the clearest, cleanest audio you have ever head from these shows. That’s because they were produced from the 20-year-old master 24-track tapes expertly recorded by longtime GD techno-wizard John Cutler in the state-of-the-art Le Mobile remote recording truck. It’s hard to beat great multitrack mixdowns of a couple of sizzling shows. But I want to start this discussion of the legendary October 8-9, 1989, concerts at the Hampton (Virginia) Coliseum by talking about the funky old audience-recorded tapes of these shows that had been sitting on very dusty, rarely visited shelves in dilapidated, embarrassingly messy and cluttered garage/back room behind my house. I guess it’s a sign of the times that I don’t even have a tape deck set up in my house anymore--all those years spent collecting tapes, making custom J-cards color-coded by era/band lineup (from Jerry’s late ’86 comeback through Brent’s death in ’90, for instance, I used a turquoise marker to write the song titles), and now they sit unloved and unlistened to, seemingly as worthless as Confederate currency. Sniff, sniff. I started with the second set of October 8, because that set marked the reintroduction of the “Help On The Way” > “Slipknot!” > “Franklin’s Tower” trifecta after a four-year absence from the Dead’s repertoire. At the time, this was a very big deal--it was truly on every Dead Head’s wish list (along with “Dark Star,” “St. Stephen,” “Cosmic Charlie,” and all the other rare and different tunes that had seemingly fallen by the wayside through the years.) I put the tape in my rather clunky yellow-and-black Sony Walkman tape player/radio and began my daily trek around beautiful Lake Merritt in Oakland (where I do all my best music listening.) I pushed “play” and was greeted by that old familiar analog hiss! You can hear the “Help On The Way” in the tune-up, and you can also hear that some people in the crowd recognize what’s to come and start cheering even before Jerry’s count-off. But when the group finally launches those instantly recognizable first three notes, followed by Phil’s ornamental bass figure, the place just explodes! There’s a deafening wave of cheers that keeps rising and then goes on and on and one, sometimes even louder than the music on my audience tape, as seemingly every person in the packed 14,000-seat arena exults in the realization they are witnessing Dead history. I literally got goose bumps listening to the crowd reaction, and a tear came to my eye as well, because I remember that feeling so well. Maybe you’re coveting a “Shakedown” or a “Scarlet” second set opener. At this point you dare not even dream of the elusive “Help On The Way”… after all it’s been frickin’ years since they played it. But suddenly there it is, filling every square inch of sonic space in the arena, and you find yourself cheering and whooping along with the other deliriously happy Dead Heads packed into the place. You’re thinkin’, “OK, I can go home happy now!” And you mean it. But at this show--at these two shows--there is so much more great music to come! Let’s backtrack for a moment to give a little context to these wondrous nights on the coast of northern Virginia. These were not ordinary Dead shows. In fact, they were the first of a small number of what came to be known as “guerrilla shows”--concerts that were announced only a week or two before they were scheduled to take place and with tickets supposedly reserved for fans living in the immediate vicinity, as a way of eliminating or at least minimizing the traveling circus following the Dead, which had been growing steadily since Garcia’s return from his near-death in the summer of 1986 and the group’s shocking subsequent success after the release of In The Dark and the smash single “Touch of Grey” in the summer of 1987. Hella people discovered that touring with the Grateful Dead was Big Fun, and unfortunately a lot of those people were more interested in the colorful psychedelic bazaars (and in many places, makeshift campgrounds) that sprang up outside of every venue than in actually seeing the band perform. The result? At every stop on the Dead’s tours in 1988 and ’89 there were thousands of people, many of them selling clothing, jewelry, artwork, counterculture paraphernalia, food--jeez, just about anything a touring Head might like--out of sophisticated metal frame-and-fabric booths (complete with dressing rooms!) or off of small blankets and out of backpacks. There was an amazing range to the commerce in these “Shakedown Street” scenes that cropped up in parking lots and parks and open spaces. The party outside became an attraction unto itself--hey, what could be more entertaining for a local teenager than this really cool scene? The music and the dance is important; being able to buy a t-shirt or camp out are not. If you’re a Dead Head and believe in us and this scene, you will understand what the priorities really are. Thanks for understanding. Mail-order tickets were also accompanied by suggestions of where Dead Heads could camp or find lodging in the area. In the case of Hampton--a popular tour stop since 1979, and the scene of 17 previous Dead concerts before these--city official were so freaked out about the prospect of a Dead Head invasion that the Dead agreed to play there with almost no advance publicity and with no mail-order tickets being sold at all, to cut down on the number of “outsiders” showing up. 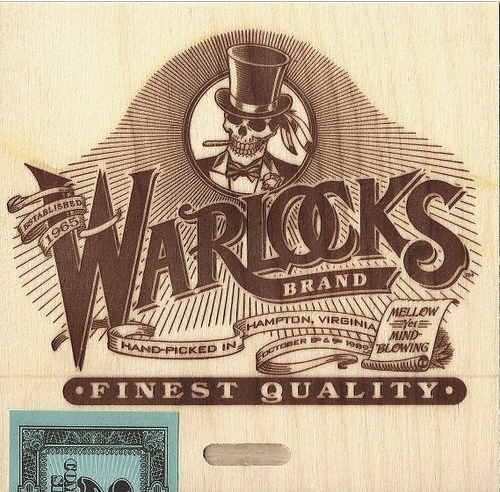 As an article in the Hampton Daily Press on October 9 put it: “The surprise show dates and location were announced October 1 using the band’s original name, ‘The Warlocks.’ Tickets were restricted to four per person and sold only through three local outlets.” The tickets for the shows read “Formerly the Warlocks,” and that was the band name on the marquee at the Coliseum, as well. Did it work? Well, sort of. Vending was way, way down, and there was no camping at all. But there were still many people who traveled great distances in hopes of scoring a ticket outside, and despite the best efforts to keep ticket sales exclusively local, a lot of “regulars” from all over managed to get in through whatever channels--but then that was pretty much always the case. Some folks were just meant to be there, apparently. That Daily Press article the first day “The Warlocks” were in town was headlined “Grateful Dead Fans Swarm to Concert” with the subhead “Limited Ticket Sales Fail to Keep Followers Away.” But the next day’s headline gave a basically favorable view: “Grateful Dead Draws Few Problems; Police Say Fans Are More Orderly This Year.” Score two points for the “guerrilla show” concept, which would later be repeated at a couple of other troublesome venues through the Spring ’90 tour. The Dead had been on a roll for some time, arguable on a continual upswing since Garcia’s return--which each tour he seemed to get stronger and more dextrous, and the band as a whole seemed positive and energetic night after night. I am among those who happen to believe that the period from the summer of ’88 through the spring of ’90 was one of the best periods of the Dead’s entire history--a time when the band was mixing their huge repertoire in interesting and creative ways, playing with fire and imagination, and only very rarely putting on a subpar show. It probably helped, too, that when the Dead weren’t on the road in the first half of 1989, they stayed in shape musically by working out arrangements for and then recording Built To Last. And before their brief fall jaunt--which, besides Hampton, took them to the Meadowlands in northern New Jersey for five shows, three at the Spectrum in Philly, two at the Charlotte (NC) Coliseum and two at the Miami Arena--the Dead did something they rarely did during this era: they rehearsed...and even worked up a few special goodies for the fans! Back in Hampton on Night One, the crowd is still stunned by the magnificent “Help>Slip>Frank” when the band kicks right into Bob’s “Victim Or the Crime,” which started out life as scary, forbidding, and slightly plodding, but has now blossomed into a very intense and fascinating piece, full of dissonant but nearly constructed musical gyrations. After that, “Eyes of the World” feels like a fresh breeze blowing through the hall, Garcia’s speedy runs seemingly emitting dazzling little points of light. On the back half of the free-form “Drums and Space” segment (which in filled with Garcia and Weir and the drummers experimenting with their MIDI rigs--there’s Jerry on “bassoon”! ), the band cruises through a sequence that includes “I Need A Miracle,” “The Wheel,” Phil and Brent’s dynamite take on “Gimme Some Lovin’”-- which never fails to lay waste to an arena--and then closes with one of the best versions of “Morning Dew” you’ll ever hear. The passion in Garcia’s singing and playing are extraordinary. The encore is another special treat: the a cappela “We Bid You Goodnight,” which had been performed just three times earlier in the year, after many years out of rotation. Ever in this era when relatively few Dead Heads conversed online, news of the Hampton “Help On The Way” and the overall excellence of the show spread quickly--mostly by telephone (sorry, landlines only in those days), and the second night there were definitely more people trying to score ducats outside. A great show, couple with rumors of what else the band might have rehearsed back in California, will do that. Finally, “Cosmic Charlie”? How about “New Potato Caboose”? Well, well, well, you can never tell. The Dead’s first set on Night Two (10/9) opens on a spacey note with “Feel Like A Stranger” (often a good omen) and then offers as eclectic a selection of originals and covers as the previous night’s. There are a couple of tunes from Built To Last, including a peppy and assured version of the title track, featuring a Garcia MIDI solo that effectively mimics a pocket trumpet, and one of Brent’s new songs, the catchy ecology anthem “We Can Run.” “Ramble On Rose” bounces along confidently and elicits huge cheers each time Jerry sings the line “Take you to the leader of the ba-a-nd!” in the bridge. With the exception of a pretty and mellow “Row Jimmy,” most of the set is up-tempo and boppin’, from Jerry’s nicely sung “Jack-A-Roe,” to an occasionally ragin’ “Stuck Inside Mobile” (in “the Dylan slot,” as we used to call it) and a charged version of “The Music Never Stopped” to close. No real surprises there, but all beautifully performed. The first sign that the second set might have something special in store is the choice of “Playing In The Band” as the opener--that often portends an exploratory pre-”Drums,” and that is indeed the case here. Jerry is clearly inspired by the possibilities of his MIDI setup and uses the “Playing” jam as a jumping-off point to get into some unusual sounds, soloing for a bit on what sounds almost like panpipes, then altering that sound with subtle and not-so-subtle effects before the jam ends up at “Uncle John’s Band,” much to everyone’s delight. After an extended closing jam on that tune and following the vocal reprise, the band immediately heads back to “Playing” territory and--in a relative rarity in those days--”completes” the “Playing In The Band” right there; always a great feeling. Then without missing a beat, they launch into the first “Dark Star” in more than five years, and the Heads go nuts! The roar that comes up from the crowd lasts nearly a full minute, and then when Jerry hits the first verse, there’s another sustained avalanche of cheers. Not surprisingly, this new late-‘80s version of the timeless classic also takes full advantage of the guitarists’ new MIDI technology, with Garcia and Weir checking out all sorts of strange timbral variations, from what sounds like electronic kalimba to that deep bassoon, ethereal shimmering cascades and synth-y “horn” blasts over the course of nearly 13 minutes of ebbing and flowing jams. Following the second verse of “Dark Star” comes another seven minutes or so of noisy, unadulterated “space” that is loaded with menacing eruptions of feedback, clashing instruments, and other assorted madness in what could well be an interplanetary war right there on the Coliseum stage! An additional 15 minutes of “Drums” (enter The Beast!) and “Space” keep the crowd drifting far from their moorings, and when the Dead then quietly come back to the world of recognizable songs, it is with a dire message: “Death Don’t Have No Mercy,” the dark Live Dead blues which had been played just once previously in its current incarnation--and for the first time since 1970--a couple of weeks earlier at a show in Northern California, so no doubt comes as another pleasant shock to the Hampton crowd. In this new version, Jerry, Bob and Brent trade off on the lead vocals and the effect is chilling indeed. Then Jerry and Brent serve up a searing “Dear Mr. Fantasy” which heads into the coda of “Hey Jude” at the end (as it had occasionally since 1985), with Brent even singing some of “Mr. Fantasy” against the “Hey Jude” melody; nice! The set ends with a double-shot of Bob: a powerful “Throwing Stones” followed by the always crowd-pleasing “Good Lovin’.” The encore that night is the last surprise, and it’s a beaut! “Attics Of My Life” hadn’t been performed by the Dead since October 1972, but you’d never know it from the solid harmonies, anchored by Brent’s angelic tenor, which is spot on. But at these two magical shows, the crowd got more than they could have hoped for--this time, the slot machine paid out a bonanza on triple roses.